1. Create a realistic and detailed cleaning schedule. Most people get off-track with their housecleaning duties due to organization issues. First and foremost, they lack an accurate sense of the time it takes to clean their house. They also don’t realize how much mess is being created on a daily basis. To tackle this problem, start by making a list of how many rooms you have in your house. Then make a list of how many people you have in your household. Time how long it takes to clean each room and divide room-cleaning duties fairly among the adults and older children in your household. Create a weekly schedule of cleaning tasks once you have done the aforementioned. Likewise, you should note down any bad habits other family members have. (E.g., leaving laundry around the house, failing to tidy up books and magazines, and so on.) Talk to them about ways to change these bad habits. You might, for instance, want to put a magazine rack in the living room and leave written reminders. If you’re having a hard time creating an effective cleaning schedule, you can use software to help. 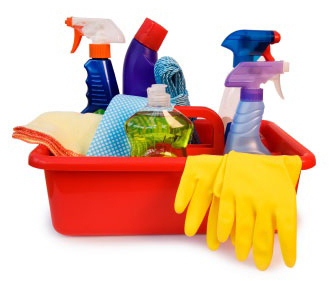 Software like “Let’s Clean Up!” is highly recommended for creating workable cleaning schedules. 2. Stick to your housecleaning schedule religiously. Life, as the saying goes, happens. A child gets a cold, you unexpectedly have to work late two days in a row, relatives come over for a surprise visit, etc… It’s easy to let the excuses pile up until your house is unmanageable again. Alas, it’s extremely hard to clean your home from top to bottom once it’s become chaotically messy. As tedious and tiring as it is, you have to stay on schedule where cleaning is concerned (barring a true emergency, of course). If you find you really can’t manage this, hire a housecleaning service to stop by at least once a week and help out. If you have a house full of souvenirs, figurines, old toys, spare clothes, and other knick-knacks, you have a home that’s hard to keep tidy. Either get rid of as many of these miscellaneous items as you can or organize them and put them into storage. 4. Dust and vacuum daily. Dust is more than just unsightly—it’s highly allergenic. According to research, at least 10 percent of the general population and 90 percent of people with allergic asthma react badly to dustmites. Your family will breathe more easily, sleep better, and subsequently have more energy to dedicate to cleaning if you keep dust from accumulating. Finally, remember that if your house is truly out of order, it’s possible to hire most housecleaning services on a temporary basis. Having a professional “deep clean” done can be the perfect way to jump-start your own cleaning efforts. After all, once your house is fully clean, maintaining it will be much easier than if you begin by trying to tackle a massive mess. Good luck!